Letter U was one of the first letters that Blonde Warrior learned this year. 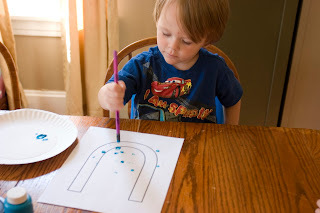 To decorate a "U" for his ABC book, he used the eraser tip of a pencil, dipped it into blue paint, and dabbed it onto his page to create "rain drops." Next, he glued a bent pipe cleaner just above the "U", creating an UPSIDE DOWN UMBRELLA. Head on over and check out Letter J.